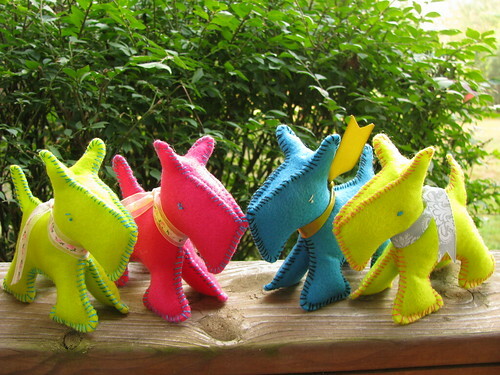 These sweet little Scottie dog stuffies were made with a free pattern from the fabulous Allsorts blog. (Her pattern is free but not for commercial use.) It’s a simple pattern and allows for a lot of creative additions. 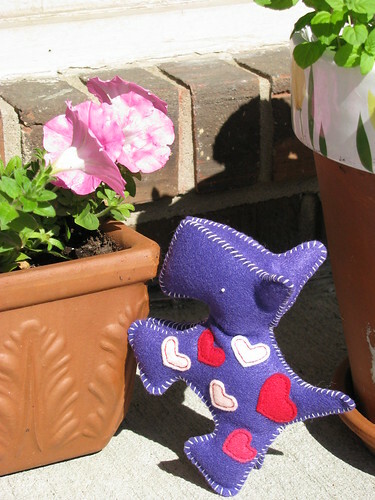 You can see many different variations in the Flickr group Scottie Stuffies. Since these puppies were going off to live with very young children, they were crafted without buttons or bead embellishments that might be choking hazards. I mailed this happy little dog off with the suggestion that he loves flowers and should be allowed to sniff them every chance he got. Doggies love to sniff stuff. Even stuffie doggies. If you decide to make one, link me up with a picture! I’d love to see it! Sarah, these are precious and I wish I had time to make one for my friend in Hawaii who raises Scotties.